Vintage inspired black & white table - Simple is always in style. 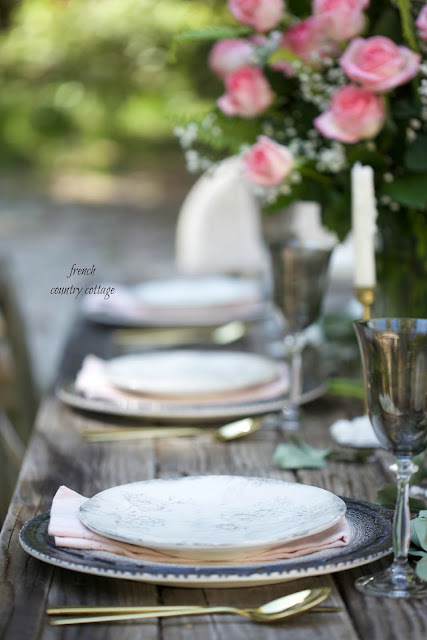 But you know... sometimes a table setting needs just a little bit of drama. Simple is always in style. 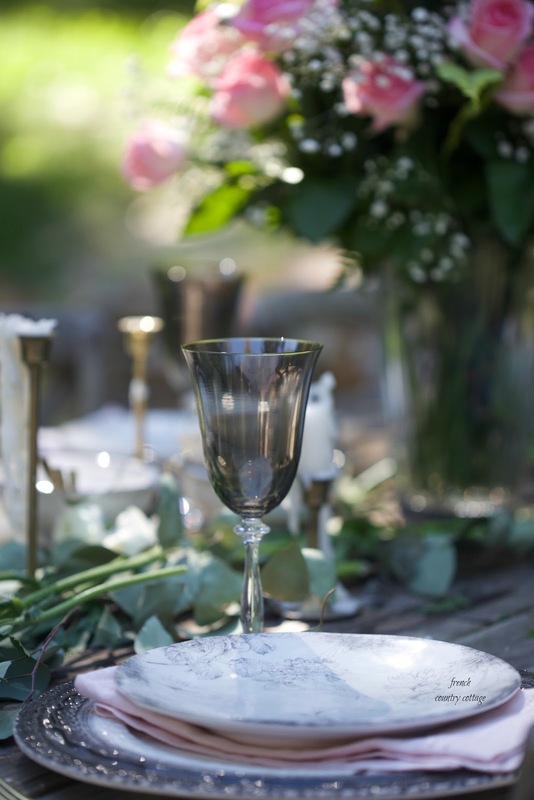 sometimes a table setting needs just a little bit of drama. 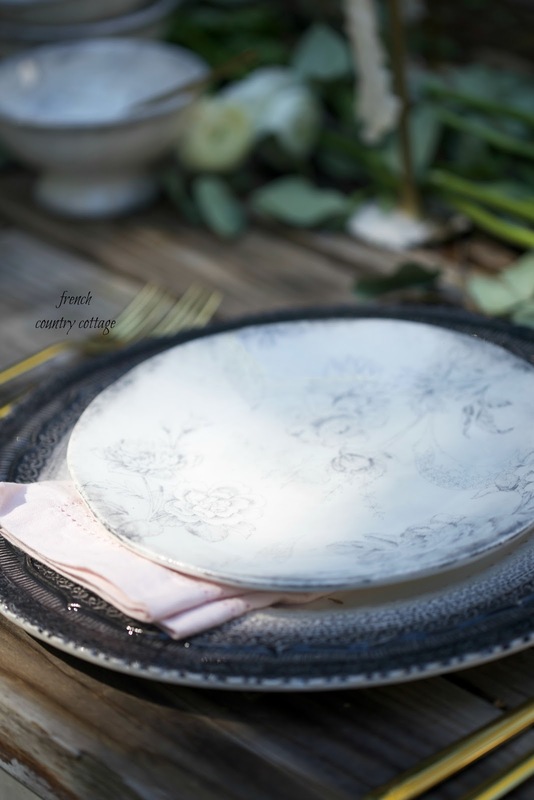 and delicate dishes that are dainty and yet bold and beautiful. And whenever I have the chance to play with a few new pieces I am a happy girl. A couple weeks ago these beautiful dishes arrived from my friends at Arte Italica and honestly, some were a complete surprise. Like those smoky wine stems and charcoal edged Finezza chargers. But when I saw them, I envisioned something that was walking on the wild side just a bit. And a pretty little and somewhat dramatic table came to life. I shared a peek of this table setting in my Mother's Day post last week- and today I am sharing all the details on those pretty little dishes. These gray wine stems are gorgeous- and so different than what I normally use. I love how they play against the soft colors in the roses and bring a moody feeling. 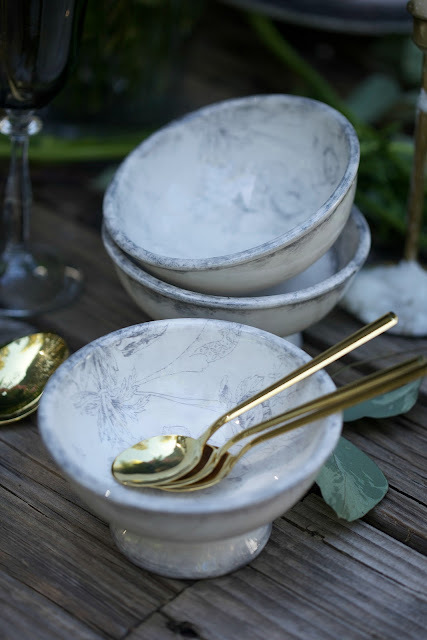 I layered the smoky edged chargers with those beautiful little vintage inspired dishes. 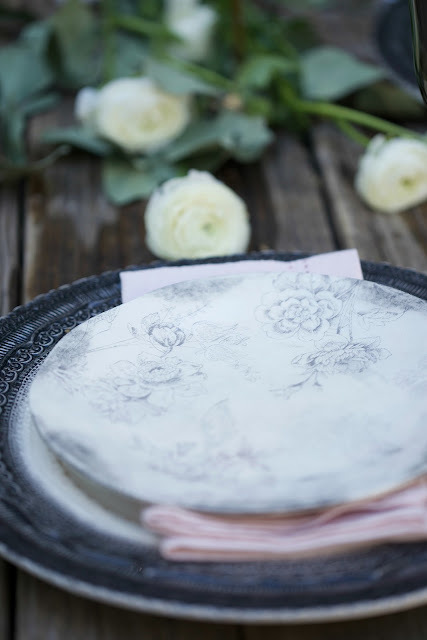 With a subtle barely there floral pattern- they bring a vintage vibe and so much pretty to each place setting. 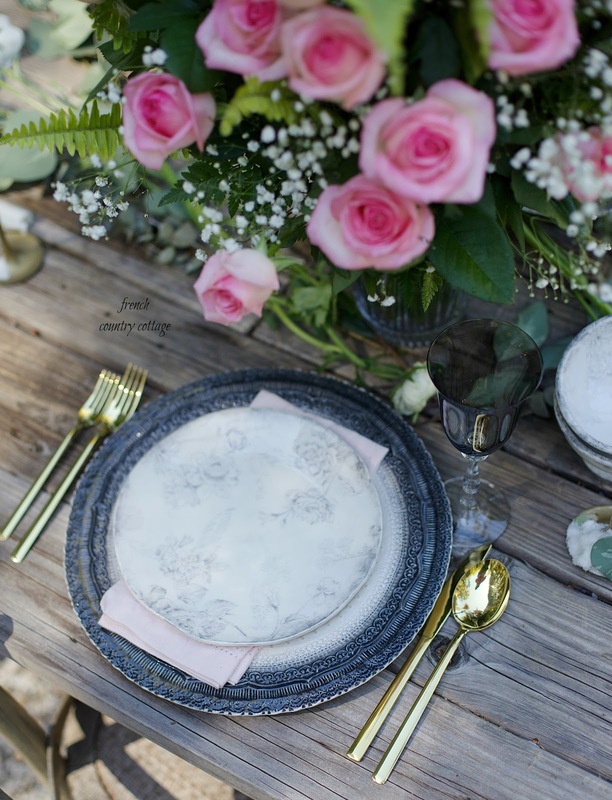 Black and white and blush needs a pop of elegance... and that gold flatware brought just that. I love the long thin and clean lines they have. As is- it is perfect for a welcoming Sunday brunch- but moody, bold and beautiful can transition to elegant evening set with just a few candles and a sprinkling of twinkle lights in the orchard. Something I can't ever seem to keep enough of in the house - taper candles. So yes, I might be that crazy lady buying 10 boxes of them when I bump into them at HomeGoods. And lately, most of them have burned down pretty quickly. If anyone has a good source for candles- I would love to know more about it. Actually I tend to buy taper candles at Ikea. Not too expensive and the right size for my candlesticks. It IS annoying when they burn down fast! BTW, if you store candles in the freezer and they will burn down slower. I love this combination of colors, the black and white plates with the pink, its gorgeous. And that wicker chair at the table...THE BEST! Thank you Ardith- they are super pretty! Looks AB FAB, Courtney! 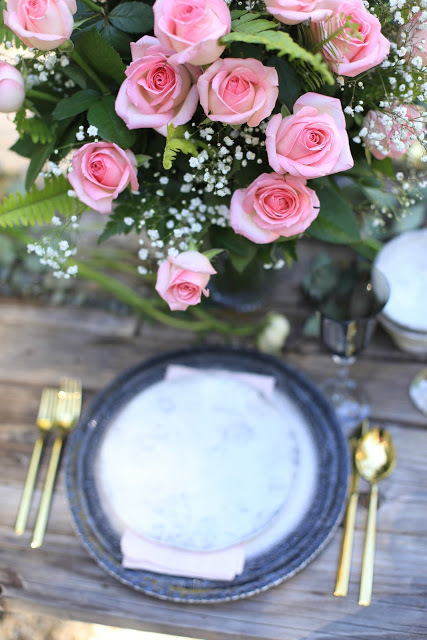 A more modern twist for you with the single bouquet and oh, so clean lined flatware! Love it. Happy Mother's Day to you! Trader Joe's is a great source for tapers. 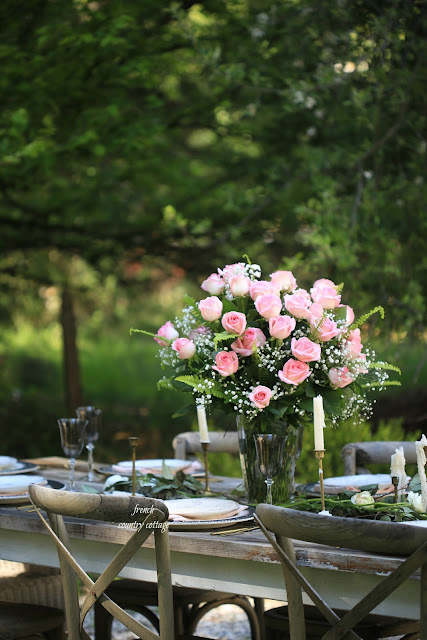 Pretty tablescape. I will have to check there. I have not thought to look at Trader's before- thank you! 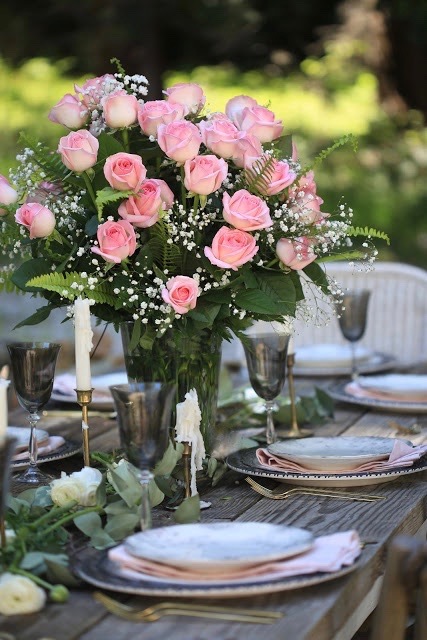 That table setting is chic and romantic. Love it! haha!! Would be so much fun!! :) Thanks for stopping by Laura!! Are those salad or dinner plates?